A 'Thumb' On The Pulse Of What Makes Us Human Sam Kean's The Violinist's Thumb: And Other Lost Tales of Love, War, and Genius, as Written by Our Genetic Code delves into the history of genetics, in the anecdotal and engaging mode of his previous exploration of the periodic table, The Disappearing Spoon. The discovery in early July of a subatomic particle that may be the Higgs boson — also known as the God particle — puts physicists one step closer to unlocking the secrets of the universe around us. Sam Kean's dynamic, brainy new book, The Violinist's Thumb: And Other Lost Tales of Love, War, and Genius, as Written by Our Genetic Code, tells a story that's no less profound: how geneticists strive to unlock the secrets of the universe within us. Silly to compare the two? Consider this: According to Kean, there's "enough DNA in one human body to stretch roughly from Pluto to the sun and back." That DNA "endowed us with imagination," which we use to dream of "remaking life as we know it." So, if DNA hadn't shaped us the way it has, maybe we never would have asked the questions the Higgs boson promises to answer. The Violinist's Thumb inherits all the traits of its predecessor, The Disappearing Spoon, in which Kean somehow made the periodic table of elements exciting. Fans of that book will be happy to know that the author again employs an able, lively hand to unpack the story of DNA and genetics through nimble lessons in history and science, along with an assortment of colorful anecdotes and striking trivia. Among other gems, you'll hear the awful story of Tsutomu Yamaguchi, who survived the bombing of Hiroshima and boarded a train that night so he could return to his family — in Nagasaki. You'll meet Mitochondrial Eve, the "oldest matrilineal ancestor of everyone living today." You'll learn why you should never, ever eat polar bear liver. And finally, if you're a man, you'll understand why there's a pretty good chance that you're a descendant of Genghis Khan. Thankfully, for the scientifically challenged among us, Kean clearly and early in the book establishes what DNA is, and provides an easy way to differentiate DNA from genes. While "DNA is a thing — a chemical that sticks to your fingers," he writes, genes are more conceptual in nature, "like a story, with DNA as the language the story is written in." It's a good example of Kean at his best — a simple, clever image to illustrate a tricky concept. 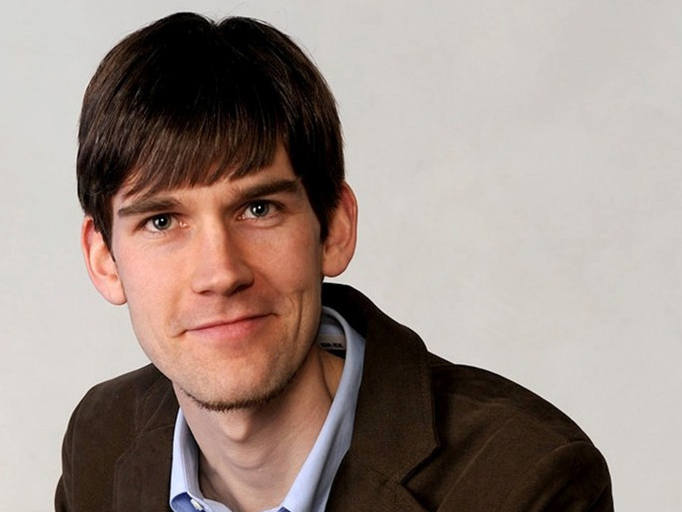 Courtesy of Little, Brown and Co.
Sam Kean is also the author of The Disappearing Spoon, an investigation into the cultural history of the periodic table. Sometimes, however, complexity wins out. For instance, the final step Kean describes in the method Frederick Sanger used to sequence the first genome, which involved sprinkling fragments of DNA with radioactive elements, still doesn't quite compute. But instead of beating readers up for not being able to follow, Kean keeps everything in The Violinist's Thumb light. For instance, when he describes the "half theories" that emerged during the early 20th century as a result of the tug of war between geneticists' and Darwinists' theories of heredity, Kean writes, "You want to scream at the scientists, like a dimwit on Wheel of Fortune or something, 'Think! It's all right there!' " He seems to understand that if folks like what they're reading, they're a heck of a lot more likely to learn what they're reading. 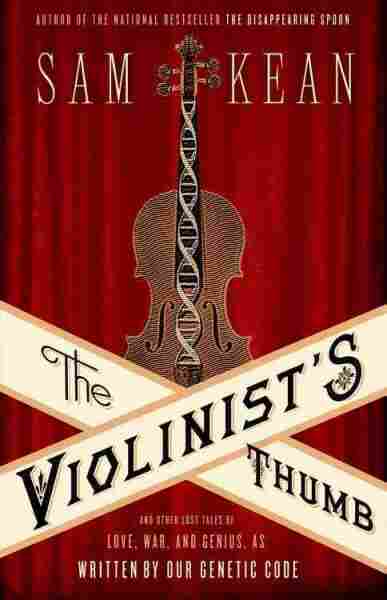 The Violinist's Thumb's most refreshing aspect is the light it sheds on the role women played in studying DNA and genetics. These include DNA pioneer Sister Miriam Stimson, a Catholic nun whose method of mixing DNA and potassium bromide into discs helped confirm the structure of DNA; Lynn Margulis, a scientist whose work with mitochondria showed how microbes have "dominated life's history"; and Barbara McClintock, whose work with corn helped her discover "jumping genes," which govern how cells specialize, "the hallmark of higher life." Early on, Kean admits that talking about genes can be a touchy subject. When scientists start breaking us down into components, we resist being "reduced to mere DNA." Even worse, when they talk about messing with what makes us, well, us, "it can be downright frightening." But the ideas Kean explores in The Violinist's Thumb ultimately ennoble us. "We human beings are humane," he reminds us, "in part because we can look beyond our biology."